In a pot, sauté onions in canola oil for about 3 minutes over medium heat and add flour and sauté till the flour turns yellow. Stir in potato cubes, carrots and peas. Saute for 2-3 more minutes and add chicken stock and salt. Bring to a boil and then, cover the lid halfway and simmer over low heat till the vegetables get soft (for about 6-8 minutes). Meanwhile, beat the egg and yogurt in a bowl. Stir the yogurt sauce into the soup slowly and turn the heat off. Sprinkle with black pepper and serve Creamy Vegetable Soup hot. Soganlari kanola yaginda yaklasik 3 dakika kadar orta ateste kavurun. Unu ilave edin ve un sariya donene dek kavurun. Sonra, patates, havuc ve bezelyeleri ilave edin. Yaklasik 2-3 dakika daha kavurun ve tavuk suyu ve tuzunu ilave edin. Kaynayinca kapagini aralik birakarak kapatin ve sebzeler pisene dek hafif ateste pisirin (yaklasik 6-8 dakika). 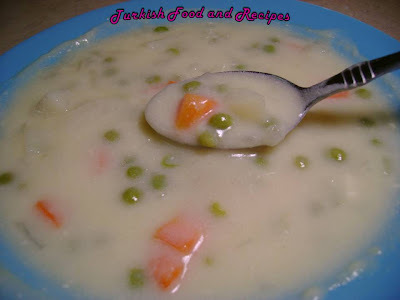 Bu sirada, yumurta ve yogurdu cirpin ve corbaya yavasca karistirarak ilave edin. Ocagin altini kapatin. Corbanin uzerine karabiber serpin ve karistirip sicak servis yapin. Beautiful photos! I really like your site.